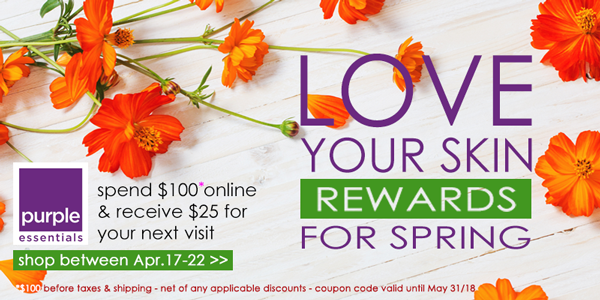 For a Limited Time - Spend $100 & Get $25 - LOVE YOUR SKIN REWARDS for Spring! Your business is important to us - and we like to reward loyalty! We are so grateful for your continued love of Purple Essentials and we thank you for sharing us in the community, it shows... what an exciting time in our fresh & natural boutique! As a small thank you, we are happy to announce Love Your Skin Rewards For Spring. We don't think of it as a discount on our product, we consider it a reward for your loyal support. Happy Spring, everyone. Shop online at purple-essentials.com before midnight P.S.T on April 22nd - Spend $100* in a single transaction - Receive a $25 coupon code for your next online purchase ... it's that simple! Balancing your Skin, Senses & Wellbeing - Purple Essential Nurtures with Nature! *$100 before taxes & shipping and net of any applicable discounts. $25 Coupon Code valid until May 31, 2018. Coupon Code will be delivered in a separate email following online transaction.